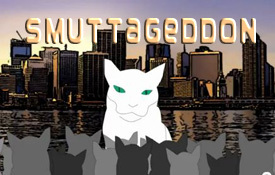 Smutty is a wonderful, creative, headstrong, feline who wants to rule the planet. He feels strongly that he could do a better job than those that currently rule the place. He wants to plant lots of grass and catmint (Nepeta mussini) to cover the planet and make it more cat friendly. You can follow the ideas and antics of Smutty in The Daily (C)rant.